Worldwide health insurance and services for career Maritime Crews and Employers - The GeoBlue Maritime Navigator health plan is designed to meet a crew member's need for comprehensive worldwide benefits - inside and outside the U.S. - without the typical limits, eligibility conditions and benefits exclusions common among traditional plans. As global lifestyles emerge, the demand for comprehensive international health insurance has grown rapidly. In response to this demand, a new generation of superior health plans is now available to serve expatriates and their families. This is a positive development for American expatriates who have historically had limited choice when it comes to coverage. Existing insurance options have often missed the mark because of limited benefits, long waiting periods, harsh exclusions, per-certification penalties, lack of portability and other hidden gotchas. GeoBlue Navigator is the premier maritime health plan because it combines these benefits with concierge-level medical assistance and easy access to an elite community of carefully selected hospitals outside the U.S. and a network of over 700,000 doctors and hospitals inside the U.S. through the Blue Cross and Blue Shield Network. GeoBlue Navigator gives crews peace of mind, knowing they always have the freedom to access top medical care and benefits no matter where their ministries take them. Geoblue has a network of doctors from almost every specialty in over 180 countries to see you. Only a small fraction of doctors around the world meet GeoBlue standards - participation is by invitation only. GeoBlue seeks out professionals certified by the American or Royal Board of Medical specialties who speak English, and they factor in recommendations by over 148 Physician Advisors from all over the world. GeoBlue then assembles in-depth profiles so members can choose with confidence and GeoBlue puts formal contracts in place to ensure patient access. GeoBlue doctors bill them directly so you don't have to file a claim. If you receive treatment within the United States you have cashless access to the Blue Cross and Blue Shield network in all fifty states. GeoBlue maintains unsurpassed resources designed to promote personal safety by giving members convenient access to vitally important news, health and safety analysis and medical translation tools. GeoBlue coordinates emergency services with a worldwide network of contracted Physician Advisors as well as air ambulance operators selected for their safety records. Members in need of life-saving medical intervention are treated in Centers of Excellence in the U.S. and around the world, whenever possible. Why Choose the GeoBlue Maritime Navigator for Crews Plan? GeoBlue Navigator offers comprehensive benefits and a range of deductible options that allow members to select the right amount if insurance coverage for their budget and lifestyle. For families, the deductible and coinsurance maximum is a multiple of 2.5. After 364 days of continuous coverage, Navigator members may re-enroll in a plan that matches their existing befits. 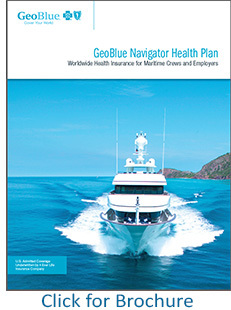 GeoBlue Navigator offers four deductible plan choices, $250, $1,000, $2,500 and $5,000. GeoBlue Navigator has three tiers of coinsurance; 100% outside the United States, 80% in-network in the United States, 60% out-of-network inside the United States. All GeoBlue Navigator plans have an unlimited lifetime maximum and a $250,000 maximum benefit for emergency medical evacuation. The Out-of-Pocket Maximum is calculated by adding the deductible and coinsurance maximum together. Who is eligible to buy a GeoBlue Navigator Plan? All U.S. citizens and U.S. permanent residents living abroad who are 75 or younger at the time of application are eligible to apply for coverage. All legal residents of the U.S. (citizens and permanent residents) are eligible if they apply from an approved state. The Eligible Member must be scheduled to reside outside of his/her country for at least 3 months in the first year of coverage and must be involved in Missionary activity. Go with a name and brand you can trust. GeoBlue is the trade name for the international health insurance programs of Worldwide Insurance Services, an independent licensee of the Blue Cross Blue Shield Association. GeoBlue health plans are offered in cooperation with certain local Blue Cross and Blue Shield companies, with a network that includes more than 90 percent of physicians and 80 percent of hospitals across the U.S. GeoBlue’s comprehensive portfolio of international health insurance plans demonstrates the commitment to covering members both at home and abroad. Strength of a U.S. Insurer - Underwritten by 4 Ever Life Insurance Company, rated A- (Excellent) by A.M. Best. 4 Ever Life is an independent licensee of the Blue Cross Blue Shield Association. Better Coverage - Their plans are U.S. licensed and feature coverage more generous that plans sold as "surplus coverage". They do not impose precertification penalties for hospitalization. They provide coverage for pre-existing conditions for medical evacuation. Pre-existing conditions are also covered in all instances by GeoBlue's Choice plan. Applications are available online or may be initiated by telephone (619) 435-6700 or email. A personal check, money order or credit card number must accompany the application and must be sufficient to pay for one month of standard premium. GeoBlue will hold the form of payment until an underwriting decision is made. If your application iis accepted, the payment will be applied to your account. Quotes obtained online or by telephone are advisory only. Actual premium is determined by the medical underwriting process. GeoBlue will review your medical history as provided on the application and may request an Attending Physician's Statement. GeoBlue publishes standard premium rates for non-smokers. Smokers and other applicants with certain medical histories may be offered a policy at a higher rate. Not all applications will be accepted. Your effective date of insurance will be on the 1st or the 15th day of the month following underwriting approval. GeoBlue Navigator is designed for extended living abroad. You can choose to enroll in a new when your existing plan expires. When you do, there are no medical questions and premium rates do not change based on your individual claims history. Your new rate will be the same as all persons covered in your rating class. Residing or traveling for a short term period outside your country of citizenship may create challenges to your current health care program. Brief trips expose you to risks which may not be covered by your current domestic health insurance plan. It is prudent to procure International Health Insurance coverage prior to leaving your home country and traveling aboard. In addition some countries you may be traveling to may require proof of coverage as a condition to your visa. When you are traveling abroad and your coverage needs to provide benefits for things such as Sickness, Accident and Medical Evacuation. Most domestic plans do not cover medical evacuation which can cost as much as $250,000 or more. In addition you will also need more than insurance. You will also need knowledge, information and safety resources that will help keep you safe and health. Health and accident international health insurance for short term trips. International health insurance for the international travelers who are frequent travelers. Groups traveling Internationally that have five or more people qualify for lower rates. Living outside of the United States or your home country for more than 6 months creates a threshold that you cross that requires a thoughtful approach to making sure your health insurance coverage meets or exceeds your needs. This is especially true for those of us who live in the United States. If you have a domestic health plan it is important that you look carefully into the details of the plan should you move outside the U.S. for more than 6 months. Most plans will not cover you once your have moved and are outside the country for an extended period of time. And for those plans that remain in force while you travel - be careful as the coverage will generally only cover you for emergencies. Coordination of payment with overseas providers will more than likely not exist and should you end up in a medical facility that is not part of their overseas networks than you will more than likely be on your own and responsible for your own payment for services. ©2000 - 2018 Timothy N Jennings, Authorized Agent, All rights reserved.